Of course Max is nervous on this return......and Liz is claustrophobic. Max did a good job of calming her down. So now they must get rid of the evil......with infusing goodness. Mr. Parker plays a sick joke on Max by returning them to the scene of the crime. Poor Max and Liz interrupted......Mr. Bleecher is missing. I accidentally updated, when I wasn't supposed to (the post is not really complete). But, apparently, I can't delete this post. So I'll just fill it in with me saying that there'll be an update later today. Thank you for the heads up. Can't wait to find out what will happen next for Max, Liz and others. Hoping for a happy ending for Max, Liz and others. This is not really "The End"
We have reached the end of "Unbreakable - A Beautiful Lie". I have loved the whole journey of writing it, of the characters taking control over me and telling their story through me (as they usually do), and interacting with you, my beautiful readers. Before I go ahead and reply to the feedback for chapter 118, I'm gonna take a moment to thank everyone that has ever left a note/feedback on this story, because even if it's just one word or an emoji, I appreciate it more than you'll ever know. Thank you for all the words, the compliments, the lengthy feedbacks, the short feedbacks, the reactions and the discussions. I don't think I have ever written a story that has spurred so many theories and discussions. It's been a delight to take part of your engagement in this story. I presume you mean Mr. Evans… In all honesty, I don't think Mr. Evans fully realizes the emotional impact of certain acts upon Max and Liz. He's getting better at it, but he's not quite there yet. What a beautiful way to heal the evil prisoners! ONLY ONE MORE CHAPTER TO GO!!! but happy to have a sequel I can't wait to read them all. Seriously, you make my day. Thank you. I will stick around for quite some time. It takes me a couple of weeks to write a story And a couple of years back I left a note here (I think it was on "Snapshot") that I wouldn't be posting anything else. But, of course, I couldn't stay away from writing. I have a companionship story planned for the "Unbreakable"-series. So there's still more to come. It really warms my heart that you care so much! I felt the blood drain from my face while the remnants of a conversation between Max and I rushed through my memory. Never look the mayor in the eyes. Because he can do what Command can do, as long as he has eye contact. He likes to play, like a cat does with its prey. He’ll kill you for his own sinister pleasure, rather than just kill you. He’ll like to torture you first. ”What?” Max breathed with a mixture of annoyance and anger. I knew what it meant, but I was hoping Max’s father would tell us something completely different and kill my fears. Disappointed that the remaining aliens couldn’t even capture one alien, considering that we had done the largest part of the job for them: killing Command. Next came fear. It was brought on by the realization that, with the mayor hiding somewhere, we couldn’t know when, where, or if he might strike. The overwhelming, all-consuming, drowning fear coursed through our bodies and minds like acid, distancing us from the meeting, cocooning us inside our minds and the privacy our connection provided. There, within the connection, we alternated between trying to calm ourselves down - attempting to convince ourselves that it wouldn’t be that bad and that the (good) aliens most likely would quickly locate the mayor and bring him to justice - and plummeting into deep darkness with the conviction of having no way out. After about half an hour of that, with Max’s father asking for our attention, we went into our current state of mind: apathy. Eventually, my body was fed up with all the emotional pressure and decided to throw some very real and very physical symptom in my direction; nausea. Perhaps as a final resort to get me out of this situation. It was strong, sudden and invasive. It didn’t slowly creep up my throat like it usually did, instead it instantly fired up my salivary glands, making me produce more saliva than normally, forcing me to swallow and swallow while I fisted my hands against the surface of the brown leather couch. The meeting had grown immediately quiet and if it hadn’t been for the effort it took me to concentrate on not throwing up, the silent stares that followed my hasty departure from the room would have creeped me out. I hated that Max was there. Even though he was holding my hair back, like the perfect boyfriend, while stroking my back, I hated that he had to see me like this. I worried that he would find me disgusting, that he felt forced to be there and support me even when he didn’t want to. I knew it was ridiculous. Max could read my thoughts for Christ’s sake! There really was no borders between us, nothing that could be weird or odd at this point. Still, hurling in front of him had heat blossom my cheeks and me turning my face away from him the second my stomach calmed down, so he wouldn’t see the droplets of vomit on my chin. “You okay?” he asked softly, worriedly. He sounded washed out, tired. Finished. As if he had been the one emptying his stomach contents, not me. With the back of my head to him, I nodded, discreetly wiping my mouth with my hand. I wanted to get to the sink and wash up - the smells surrounding me were not very conducive to preventing further vomiting - but I felt as tired as Max sounded. All energy had left my body. I felt weak and worthless. Max was reading my mind, already getting to his feet to help me, and I seriously considered waving him off, asking him to please leave me alone, but reluctantly I knew that I needed his help. I also knew that he was hurt by the fact that I didn’t want him to be around me right now. And I knew that he was annoyed by the fact that I thought he found me disgusting, when he was merely worried about me and wanted to help. But he said nothing. Neither vocally nor telepathically. He placed both of his large hands under my armpits and lifted me to my feet. Getting to the sink was only a matter of moving about five feet to the right, but it felt like a monumental distance. The porcelain was cool beneath my gripping hands and I paused there, leaning over the sink with trembling legs, my head bowed and the nausea flowing through me in (more manageable now) waves. Without a word, Max reached around me and turned on the faucet, adjusting the temperature before letting it flow in front of me. I watched the water swirl down the drain, felt his presence around my back and was secretly relieved that he was there. My hands were trembling as I reached into the stream from the faucet, cupped my hands around the water and brought it to my face. Over and over again I had the water splash against my reddened cheeks, washing away the remnants of my nausea and the cold sweat on my forehead. Max waited. Giving me space while at the same time being very close. He was good at that. Being exactly what I needed without me having to ask. Without me knowing myself what I needed. Eventually I looked up into the bathroom mirror, looking at my pale reflection, and meeting Max’s eyes. “I don’t think I can do this all over again.” My voice broke, tears building in my eyes at a ridiculous speed. Immediately, Max’s arms were around my waist, pulling my back towards his front, placing his chin on my shoulder and kissing me softly on the side of my neck. “I don’t want to do this all over again,” I sobbed, breaking. He just hugged me tighter, placing random kisses against my neck and shoulder where my sweater revealed skin. The fact that he didn’t say anything, that he did not offer me any nonsensical soothing words or tell me white lies about how everything would work out for the best, made me cry even harder. Because there was nothing to say. There were no more words. No words would offer us comfort. We were trapped. Again. I had bought it on the way back from the Institute. I had come up with an excuse to use the bathroom at a petrol station and while returning the bathroom key, I had purchased one. I hadn’t told anyone about it. Hadn’t informed anyone of my suspicions. But I could see on his face that Max knew. The strangest thing was that he wasn’t asking me about it, didn’t ask to talk about it. We pretended that everything was normal. Well, as normal as our world could get. Caught up in the war, I had no concrete way of knowing how late I was, but late it was. I had blamed my lack of menstruation on stress and lack of food, but changes to my body was making me think otherwise. I got up from the toilet, put the white plastic stick with the digital screen on the edge of the sink, and distracted myself by wiping, pulling my pants up, and flushing. But my heart was pumping out of my chest, adrenaline, fear and nervousness drowning me. My knees were shaking as I stood looking at the digital hourglass, waiting for the answer. The soft knock on the door made me jump, caught off guard. Max. Once again, I had forgotten about him being inside my head. My cheeks were burning and my hands were shaking when I turned on the tap and started to wash my hands, my eyes fixed on the digital test application. ”I’ll be right out!” I announced, my voice shaking. I felt sick, the nausea creeping threateningly up my throat. ”It’s going to be okay,” Max said, the softness to his voice barely enabling his voice to get through the closed door. The last word of his concerned assurance coincided with the disappearance of the digital hourglass in the display. I stared at the text that instantly appeared in place of the hourglass, a mixture of fear and disbelief pressing down across my chest. ”Something has happened,” I vaguely heard Max say, past the rushing of blood in my ears. I swallowed harshly and picked up the application from the edge of the sink. I brought it closer to my face to make sure I had read the small print correctly, but my shaking hands were making the text blurry and basically unreadable. It was not facilitated by the tears in my eyes. I inhaled, trying to force the tears back, reached over to pull out a long stretch of toilet paper which I used to wrap up and hide the test in. Stepping on the floor pedal to the bin, I placed the application with the waste, hiding it underneath the pieces of dental floss and toilet paper to disguise it even further. ”I’ll be right out,” I told Max, not recognizing my own voice. I washed my hands again, shakily dried them off on the soft aqua-colored hand towel, took a quick look at my flushed face in the mirror, surprised that I didn’t look that different, and took a deep breath in attempt to collect myself. Walking up to the door, I stopped right inside of it, feeling Max’s presence through the door, and hesitated to turn the lock. My gaze moved from the door knob to my abdomen and I halted. Placing my hand gently against the lower part of my abdomen, I was hit with a flood of emotions. Not all of those emotions were mine, they were mixed up with Max's. Sorrowfully, he whispered, ”Lizzie,” through the door. Leaning my forehead against the door, my hand still on my abdomen, I let the moment surround me for a couple of seconds before letting it go. Straightening, I opened the door, almost stepping straight into Max. He was standing right outside the door. Almost pressed up against it. I recognized the look in his eyes now. The shadows that had quickly passed through his eyes at various times these past few days. He took my hand, causing me to look down at where his dark olive skin contrasted with my porcelain tone, his large hand enveloping my much smaller one. ”You knew,” I stated quietly, eyes fixed on our hands. Without a word, he pulled me into his warm chest, his arms tight around my back, the side of his cheek resting on the top of my head. I stood still, frozen. I felt like a statue, a robot. My emotions were all over the place, trying to - firstly - deal with the news, and secondly, trying to figure out how to react to the fact that Max had known and had chosen not to tell me. Why would he hide it from me? Unexpectedly, I was flooded with anger. Why? Why couldn’t we talk about this now? What could be more important than this right now? Why did we always have to end up at the bottom of someone else’s priority list? ”I’m sorry,” he said quietly, no doubt feeling my anger. But while anger was threatening to consume me, making me grow even stiffer in Max’s embrace, I became aware of Max’s emotions. I had believed them to be in response to what I had just found out in the bathroom, but once I refocused from the anger and dug through Max’s mind, I became certain that something else actually had happened. Something that had shaken Max. And the fact that Max seemed more shaken by this other thing than by what I had just experienced both fueled my anger and poured blinding hurt on top. I wiggled out of his arms and looked at him. To be honest, I glared at him. I found myself immune to the paleness of his face, to the simmering tears in his eyes, to the dilation of his pupils. I couldn’t take in his feelings right now. I was too overwhelmed by my own. An old man’s face flashed in front of my inner eye. There was something familiar about him, but I couldn’t quite put my finger on it. I bit into my lower lip, taking a step back from my boyfriend. I was really not in the mood to meet people. I wanted to cry. I wanted to talk to Max. I wanted to figure things out. He looked like he was about to collapse when he reached out and his finger silently captured the single tear that was rolling down my cheek. But even with his obvious distress, shock and sorrow, he emitted control and strength. It never ceased to amaze me how he could keep it together. Through everything. But right now, his control was infuriating me further. ”I don’t feel like meting people right now,” I told him honestly, pointing out something he obviously already knew. I was perplexed by the fact that Max wasn’t giving in. At other times, when it came to his father and the rest trying to force Max to do anything he didn’t want to, he had always put up a fight. But he wasn’t this time. Even though I could tell that he wanted to protect me and didn’t want to force me, he was still pushing. ”Just come with me,” Max said in explanation. I looked at his face for a long time, tuned in to his emotions, tried to sort out his thoughts, but my hurt was muddling everything and I couldn’t focus. ”Let’s just get it over with,” I mumbled, feeling betrayed and alone. Max reached for my hand and I reluctantly let him take it. ”I love you,” he said quietly. I knew I hurt him. Which made me feel terrible. Which made us walk in silence downstairs, with me experiencing an almost out-of-body feeling. I felt detached from this world, only thinking about the thing I had hid in the trash in the bathroom. Isabel was there. So was Mr. Evans and Alex. I could see them from the middle of the stairs, gathering around someone I didn’t know in the living room. Max’s grip on my hand tightened, which had the effect of putting me on alert, of sharpening my senses. Before we had reached the last step of the flight of stairs, Mr. Evans moved to the side and revealed the old man that Max’s mind had flashed me earlier. His hair was grey, with strands of white, and it was rather neatly cut. He had a short beard, just enough to shadow his wrinkled face. He was thin, but didn’t look weak. He was standing tall, assertiveness in his stance. But what I noticed the most were his eyes. Eyes filled with warmth and gentleness. Eyes that widened as they saw me. And I knew where I had seen those eyes before. In a memory. A memory projected into my mind by Max’s father. I grew still, unable to look away from the eyes that were so similar to Max’s. Max had his grandfather’s eyes. The grandfather who had lived on another planet as a child. The grandfather who was one of the few healers sent to planet Earth. The grandfather who had known about parims. The grandfather I had been told was dead. A/N: It doesn't end here. 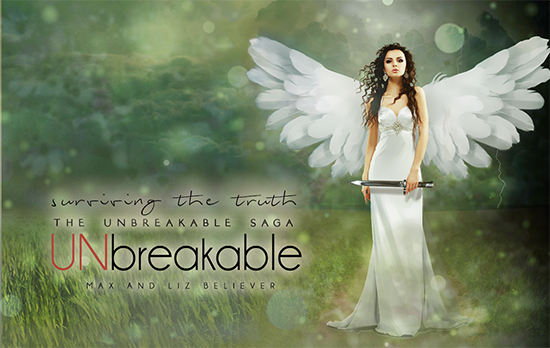 The sequel is called "Unbreakable - Surviving the Truth" and will be posted here on RoswellFanatics soon. Last edited by max and liz believer on Fri Jul 07, 2017 4:28 am, edited 2 times in total. However I'm very proud of the great boyfriend Max is demonstrating. When is the sequel going to be here???? You're leaving us with a cliff hanger…. keepsmiling7 wrote: When is the sequel going to be here??? ?